Perfect for the Wonder Woman your life. 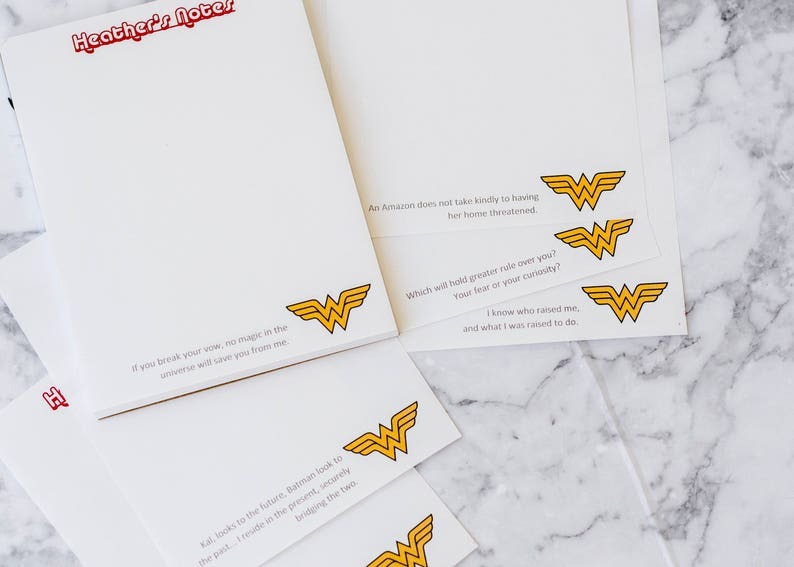 This Diana Prince inspired Note pad personalized with your (or your friends) first name and 6 quotes on the bottom. Choice of name colours and 6 quotes! Made using 24lb bond paper with either 50 or 100 pages. Page Size quarter page 4.25" wide by 5.5" high or half page 5.5" x 8.5". Includes a coordinating card stock backing. Makes a great gift for the superhero fan in your life, or for you own desk or work space. 1. I know who raised me, and what I was raised to do. 2. Which will hold greater rule over you? Your fear or your curiosity? 3. An Amazon does not take kindly to having her home threatened. 4. Women are the wave of the future, and sisterhood is stronger than anything! 5. Kal, looks to the future, Batman look to the past... I reside in the present, securely bridging the two. 6. If you break your vow, no magic in the universe will save you from me. 7. Women are the wave of the future, and sisterhood is stronger than anything! 8. This is a job for Wonder Woman! 9. These shoes are killing me! 10. You obviously have little regard for womanhood. You must learn respect! 11. I'm sorry, but it has to be this way. 13. We use our power to protect the world. We always have. 14. And as for age, I will be 2,527 years old on my next birthday. 15. All of you, fight on! To the last breath FIGHT ON! 17. Which will hold greater rule over you? Your fear or your curiosity? Please include the desired customization in the notes to seller. If no customization details are given just 'Notes' will be on the top and randomly selected quotes used. My daughter was thrilled with her notepad. Very fast service; would order again from this seller. Such a great gift, my friend absolutely loved it and the quality was great! Great customer service, quick shipping.